How to view the most common statistics for your publications? Google Analytics (for short GA) is designed to gathering information about publications, so you can get insight into your audience’s usage of your flipbooks. 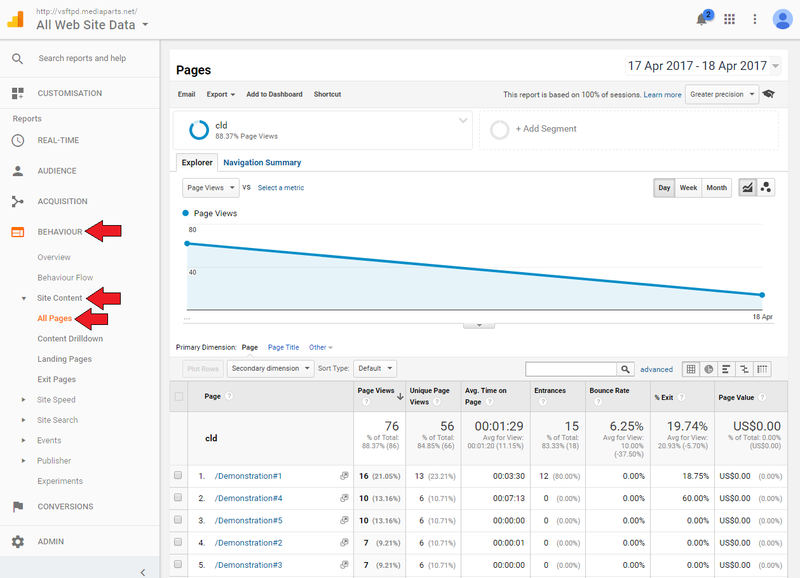 Thanks to Google Analytics it’s possible to see, for example, how often certain pages were visited, what device was used, which links your users clicked on, and much more. Data is collected as soon as you upload a GA-enabled publication to your website or to FlippingBook Cloud. The statistics are normally available within an hour, but sometimes it takes up to 24 hours for user activity to show up in your reports. How often were specific pages visited? How often were your publications visited? How to set the reporting interval? 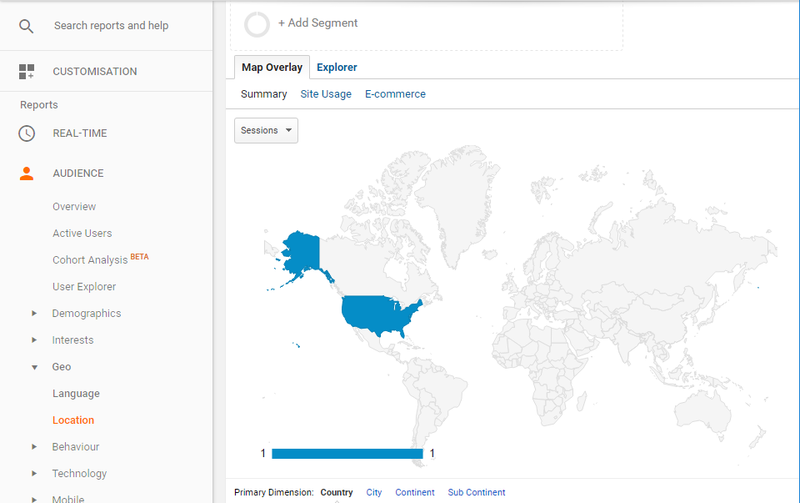 How did your visitors get to your publications? How to see detailed information about your audience? here we explain which data FlippingBook adds in addition to the standard GA-data and how to use it. How often were videos watched? How often were links in publications clicked? Which search terms were used? How often were publications shared on Social networks? How often were my publications printed? Every page in your FlippingBook has its own link. For example, suppose that we have our publication uploaded as https://flippingbook.cld.bz/Demonstration. The link to the first page will be https://flippingbook.cld.bz/Demonstration/1, the second one https://flippingbook.cld.bz/Demonstration/2 and so on. You can see how often each individual page of your publication is viewed in GA, by going to Behavior > Site Content > All Pages. Note that the link in GA uses a hashtag instead of a slash! The column ‘Pageviews’ shows how often a specific page is viewed. In this case, pages 1 is viewed 16 times, pages 4 and 5 are viewed 10 times, and pages 2 and 3 are viewed 7 times. The column ‘Unique Pageviews’ shows how often a specific page is viewed but it doesn’t include repeated views from a user after the first one. So in the example screenshot above, page 1 was viewed 16 times, by 13 different users. Pages 2 - 5 were viewed by 6 different users. If you want to know how often a publication was visited, irrespective of the exact pages, then that is possible too. All pages in your flipbook share the same ‘page title’. 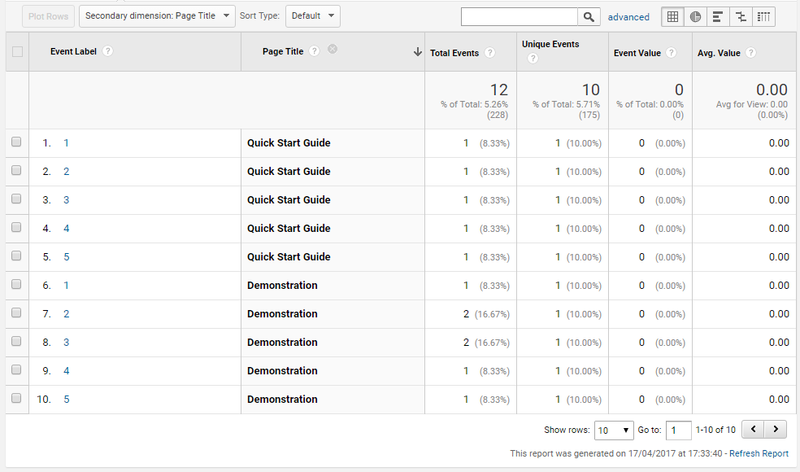 In GA, we can consolidate pages with the same title by changing the primary reporting dimension to ‘Page title’. Go to Behavior > Site Content > All Pages and click on Page Title. The ‘Entrances’ column will then show how many users opened at least one page in your flipbook. Average page on time: this shows how much time the average user spent on this page. Be very careful when the number of pageviews is low. 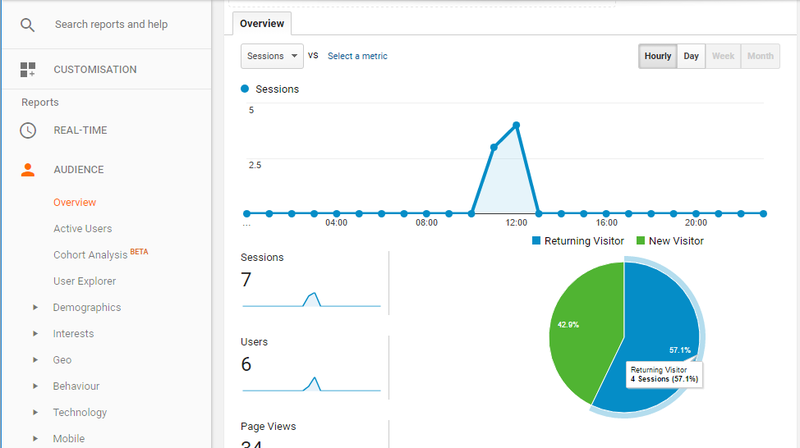 If you have 3 pageviews, and one of your visitors went to lunch when this page was open, then the value will skyrocket! Bounce rate: this denotes which percentage of visitors that opened your publication on this page immediately left again. %Exit: this denotes how many people left your site after visiting this page (but as opposed to ‘bounce’ they may have visited other pages before). Page Value: not applicable to flipbooks. It is possible to set a time frame to a specific period. You can do this at the top right corner of the page. Just click on the dates and choose the period you want. Note that by default, the reporting period is set to end yesterday, so will not include today’s clicks if you don’t change it (good to know if you are testing or have just launched a new publication). One of the most interesting facts to learn about your publications is how people actually got there. Did they use a search engine? Social media? A sponsored link? You can view this information as follows. Go to Acquisition and click on Overview. 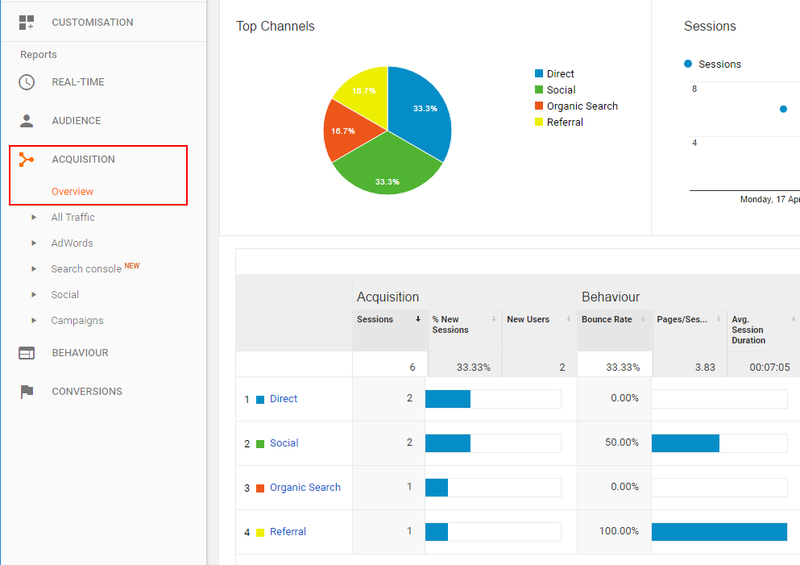 You will see a pie chart which display what channels your visitors used to get to your publication. Social: referrals from facebook, twitter, etc. For more detailed information, you can click on e.g. ‘Referral’ to see from which links people were referred to your publication. In the example, this 1 user that visited our publication from a link on another page used a link on helpdesk.flippingbook.com. If you go to the Audience > Geo you will see a clickable map, highlighting where your visitors come from, with the more solid colors indicating higher volume. Information about which browsers and operating systems your users use is available under Audience > Technology > Browsers and OS. By default this shows the browser, but as you can see in the screenshot, you can change the primary dimension to ‘Operating system’ and even ‘Screen resolution’ and ‘Screen colours’. Event label: describes on which object the action was performed. For videos, this would be the link to your YouTube or Vimeo video. If you have videos embedded in your publications, then you can see how often they were opened. Be careful though, to look at the right statistic! Click on Video. You now see the total number of video events, which is not very meaningful in itself. It includes Play AND Pause events for all your videos. Change the Primary dimension to Event Action. This will show the number of plays and pause events separately, but it still is the total number for all of your videos combined. Click on Play to see the total number of times that your videos were played in detail. How often were links in my publications clicked? In the table, you will see the links in your publication that were clicked, and the number of times that happened. In our example, we see that the link was clicked 2 times. This adds the ‘Page title’ as a secondary dimension, and you can now see how often the link was clicked per publication. In the example, the link was clicked once from the flipbook ‘Demonstration’, and once from ‘Quick Start Guide'. Which search terms were used in my publications? If you use the same GA for more than one publication, then change the Secondary Dimension to ‘Page Title’ (it makes very little sense to view the data for several publications combined)! Under ‘Event label’ you will see the search terms used by your users and under ‘Total Events’ the number of times this exact term was used. Note that ‘import PDF’ and ‘PDF import’ count as different terms. Since the number of different events will probably be large, you may want to export the results to Excel or Google sheets for further analysis.The screenshot below shows where the option is located. Set the Primary dimension to Social Network to see on which social media your publication was shared. If you have multiple publications, then change the secondary dimension to ‘page title’ to see which publication was shared on which network and how often. You will see 3 different entries per publication: ‘Open’ and ‘Close’ will be approximately the same. They denote the number of times that users opened and closed the print dialog box. ‘Print’ shows the total number of pages printed. If you use the same GA for more than one publication , then change the Secondary Dimension to ‘Page Title’ (it makes very little sense to view the data for several publications combined)! 4. Click on ‘Print’ (under ‘Event action’) to see how often each page was printed individually. If you use the same GA for more than one publication, then you will again have to change the Secondary Dimension to ‘Page Title’ to see the number of prints per publication! Several other events are tracked in a similar way as described above, but these events are less relevant to most users. Please remember to set the secondary dimension to Page Title if you use GA to track several publications! How often was a page viewed in ‘Spread’ mode or as single page (zoomed mode)? On which pages did users zoom in and zoom out again? How often was the Share-button clicked? Note that this is NOT the number of actual shares on social networks, which we described in detail above. But under Events > Overview you will see the Share-category, with Open and Close actions in it— simply displays the number of times the share window was opened/ closed. These actions have no specific labels, simply because there is nothing more to say about them. How often were pop-up images clicked? This one works a bit different than other elements (such as links and videos, as the event label to describe the event is the url). especially when you use FlippingBook Cloud. For Cloud-based publications, these URLs vary slightly almost every time the image is clicked due to technical reasons. In the report below, the image ‘screenshot.jpg’ is opened 4 times in total, but the URL is a bit different. You will have to export the report and post-process it to get a full understanding. How often were your PDFs downloaded? Click on Download -action in the Behaviour > Events> Overview. This shows the total number of actions in the Download-category. But it includes actions for Open and Close of the dialog itself. Click on Event Action to see how often these actions were performed, and then on Download which will bring up detailed information for the actual download actions. The actual file names show how often the full PDF was download, a specific page, or any additional file that was added. In the example above, the full publication (Quick Start Guide.pdf) was downloaded once, page 5 was downloaded twice, and the added file ‘justpagenumbers.pdf’ was downloaded once. How often was sound switched on or off? This may be interesting if you use background sounds for your publications. In the Sound category two actions are checked, On and Off — which shows how often your users clicked on the button to switch sound On/Off. There is no Event Label to describe them in more details, but like with all other events, you may have to set the 'secondary dimension' to 'Page Title' if you track multiple publications. How often did users utilize the Full screen mode? The Fullscreen category contains On and Off actions, which simply displays how often fullscreen mode was switched on and off for your publication(s). How often were the ToC and Thumbnails used? Go to Behaviour > Events> Overview and click on either 'ToC' or 'Thumbnails' under Event Action. Open shows how often the ToC/Thumbnails side windows were opened, and Close how often it was closed. Note that if you have set the Side window in your publication to open the ToC or Thumbnails by default, then every time the publication is opened, this is metric will also be increased by 1. Also note that there is no specific information gathered about which thumbnail or ToC-entry was clicked on.